WPMu Sitewide Tags, Feeds, & Archives! Oh, My! So….so so so so so so, it’s time for a little walk down WPMu history lane. Last year at this time I was desperately scrambling for a way to have sitewide tags for UMW Blogs. I found the solution in Dr. Mike’s hack shared on the WordPress forums here, but it was kind of a mess even then. Yet, the concept was brilliant: a separate site that allows you to archive, search, and create a tag cloud for categories through a good ol’ spamming plugin—DIY ingenuity at work given the limitations of WPMu at the time. The set up ran on a separate single install of WordPress that was pulling in the sitwewide feed from WPMu (thanks to IT Damager –who has since disappeared along with his Sitwewide feed plugin) and running it through the outdated WP-Autoblog plugin, as well as a plugin for re-directing the permalink to the original blog it was fed in from (a process I detailed here). Moreover, once I got this hacked concept straight in my head and installed it, the WP-Autoblog plugin and the Sitewide feed plugin had to be further modified to work. Add to that the fact that when I updated UMW Blogs from 1.2.x to 1.3.3 the categories were no longer being pulled into the separate WP site properly, effectively breaking the tag cloud. Making the whole thing at least a partial bust right around February. In short, it was an extremely smart hack on Dr. Mike’s part, but in the long run it became more of a nightmare than an asset. 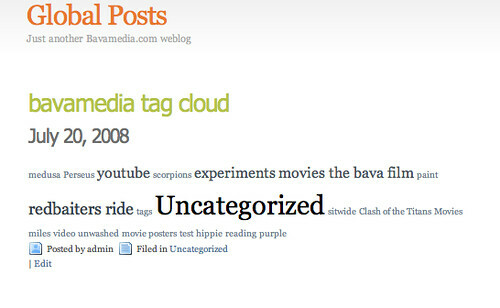 So, as soon as I saw the MuTags plugin for WPMu sitewide tags from Mr. Henry I jumped on that, and made that the default tag cloud for UMW Blogs, and used Dr. Mike’s hack as an archive for posts throughout the environment (sans categories). But Mr. Henry’s MuTags had two problems: it had no sitewide feed for each tag, and it couldn’t incorporate categories into the tag cloud. Moreover, when we bought the $50 extension for the plugin which allowed feeds for each tag, I found the feeds to be pretty poorly parsed and ugly 🙁 But I was hopeful enough to blog it, and when Stephen Downes took issue with our paying $50 bucks for this functionality I wore all black for weeks and couldn’t sleep at night (this was before he discovered and broadcasted the beauty that is EDUPUNK —welcome back Stephen 🙂 ). So, that kind of brings us up to date, and it is also when a new era begins for WPMu. Because all the functionality I needed at least three plugins for, a separate WordPress installation, a brain surgeon, and a hammer to make work have all been bundled into one little WPMu plugin developed and shared by the inimitable Donncha: Sitewide Tags Pages for WPMu. This plugin gives you all the functionality that the original hack did, namely a searchable archive of posts and sitewide categories with feeds, but adds a few as well such as sitewide tags (which are really tags not categories called tags –we have figured out the difference, right?) and sitewide feeds for tags, a built-in “spamming tool” that just republishes the post from throughout the environment onto one blog in your WPMu environment at the URL http://tags.yourblog.com. And more than that, the permalink points to the original blog and the author is immediately populated in the tags blog making the whole process seamless and clean. Not to mention the fact that given it is a blog within your WPMu environment you don’t have the overhead of a separate install with outdated versioning because you don’t want to surrender the archiving functionality all together. So, how to use this? First off, keep in mind Donncha has made it backward compatible for older versions of WPMu, but I would recommend using it on 2.6 only, for it seems there are still some glitches on older versions (at least WPMu 1.3.3). Here is how I am thinking about using it on UMW Blogs. As a sitewide category/tag cloud with feeds galore, which will actually be useful for syndicating class content as I talked about in the e-portfolios post here—not to mention a few other ways of thinking about course spaces -but more on that soon. And given all the posts with both their tags and categories are in one blog, I can actually use the Simple Tags plugin to display the tag cloud, make categories show up as tags, and get a consistent feed with some related tags and posts contextual goodness. Laying Simple Tags over this blog and playing with it will make all the difference in my opinion. I have started this process as an experiment here. Moreover, we can starting thinking creatively about archiving the posts on UMW Blogs with little or no hassle. We could actually archive a whole semesters worth of posts, or year’s, by simply exporting the XML file for the tags blog, or dumping the database. In effect, starting fresh every semester, while creating a separate space for the large, searchable archive of all the posts in UMW Blogs. This plugin has the potential to solve so many problems all in one fell swoop, I’m excited about it, and will keep you updated with the process as UMW Blogs makes the transition to WPMu 2.6. P.S>–After just checking my sandbox version linked to above, it seems like this plugin also pulls in pages from around the environment, which is fascinating. 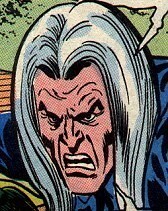 And I will have to think about the implications of this, if I am, indeed, correct. This entry was posted in plugins, UMW Blogs, Uncategorized, wordpress multi-user, wpmu and tagged archive, categories, Hack, mutags, plugins, search, tags, UMW Blogs, WordPress, wpmu, wpmued. Bookmark the permalink. 10 Responses to WPMu Sitewide Tags, Feeds, & Archives! Oh, My! Glad you like the plugin! The pages thing is probably a bug as they don’t really fit into the timeline of “archived news” that the tags is. I forgot to filter them out! Jim this post reads like you were on speed when you wrote it. Love the plugin, you rock! Thanks for making our life easier. And good to know about the pages. I’ve been re-paving the yellow brick road, changing my religion with every article I read about RSS aggregation. Seeing as The Rev has tried all the rest and likes The Don’s mojo, I can get up off of my knees. …good for nothing my teachers always said. Plus, I get to password protect the rss-Add part to keep the feeds on topic by only giving a password to whitelist site owners. I hope it’s a boy! I think it’ll be a girl, but that just means it will be smarter than you expected 🙂 Glad this makes sense and works for you, I always feel this stuff is all just gibberish, and I keep searching for the right terminology and phrasing for it to make sense. Your comments suggest there may be hope for me yet. Thanks. So, being new to RSS I’ve fallen for the late-nite-infomercial of FeedBurner. Apparently, they have what I need, once I figure out what exactly that is. Opinions? I thought that I’d track interest across categories (as some topics are geographic in nature, no pun intended) -but anyway. Piping the feedburner global feed to the plugin enabled on my primary blog does pull in the text and correct permalink to the original blog. Now that it’s posted on the main blog, it gets posted again on TheDon’d.subblog… Erck. I thought about assigning an extra “RSS”|”Syndicated” category to the content to try to filter it all out but this is starting to get messy. Taking a step back, I need to check some basic assumptions on my part. 1) Using the RSS-redirwitchery I could service rss subscribers and populate my main blog via the nifty “Now With Extra O Caoimh” subblog O global tags n’ posts. Possible? 3) This seems to be a lot of back and forth in terms of SQL queries and parsing of feeds. Not a box killer? If you look at the comments on Donncha’s blog post about this plugin there is a dude who has found a hack to have this plugin work for the moan blog. Which is very useful. I haven’t contacted him about it, but I very well might.